Home » Reviews » Book » Essential for Every Bellydancer’s Bookshelf! Essential for Every Bellydancer’s Bookshelf! 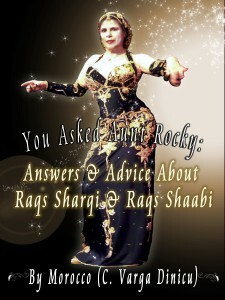 “You Asked Aunt Rocky” is Essential for Every Belly Dancer’s Bookshelf. There is a hidden repository of knowledge, wisdom, and experience within each of the “great masters” of our art; those who have been Oriental dancers (practicing Raqs Sharqi and/or Raqs Shaabi) since the 1970’s, and sometimes even the 1960’s. 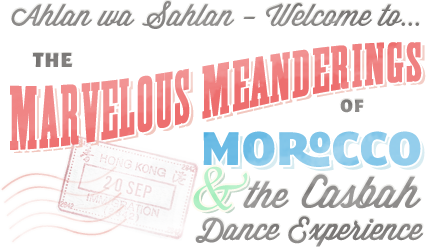 Up until now, though, to gain access to what these dancers know, we have had to spend years in their troupes and studios. Even though they’ve done their best to teach us during workshops, they can only say and share so much in less than ten hours of instruction! Eastern dances and cultures,” Morocco had created a compendium of material unmatched within the dance community. After extensive editing, augmenting, and selecting, she’s winnowed the material down to a mere 414 pages, scaled to a generous 8 1/2 by 11-inch two-column page size. This is not a “coffee-table’ book, although it contains some excellent (and historically significant and rare) reproductions of photographs. Nor is it an encyclopedia, although its scope is similar in both breadth and depth. Rather, it is *without question* the single most authoritative ethnographic sourcebook on Mid-Eastern dance and related arts, together with a collection of valuable technique pointers, specifics on dance and rhythm patterns, and a wide range of other information. At the end, there is a glossary (including dance terms from multiple languages), an excellent bibliography, and – perhaps most important (given the nature of this book) – a detailed index. If this book were simply a compendium of Morocco’s personal experience, as part of the New York dance Oriental dance community from the 1960’s to the present, this would be a valuable book. However, it is much, much more. Morocco devoured relevant books from the New York public library, and searched out rare and valuable manuscripts. This has resulted in a private library that is by now probably unequaled in the world. New York, along with national and international appearances. Morocco’s simple, direct, and practical advice – her “real-world knowledge” – should in no way discourage someone who is looking for depth in cultural awareness. Rather, Morocco brings her understanding of foreign cultures – and of how the dance is both regarded and experienced – into practical and down-to-earth terms. This book is valuable to both academics and practitioners. For all of us who “grew up” with dance teachers who themselves had only limited training; for all of us who have had to travel to workshops to study with truly great teachers; this is a superb enrichment. And for those of us who engage in serious scholarship, it is an invaluable reference. And for every practitioner of Oriental dance who considers herself to be a “serious student” (if not a full-fledged professional), it is an essential read. “You Asked Aunt Rocky” belongs on every Oriental dancer’s bookshelf. 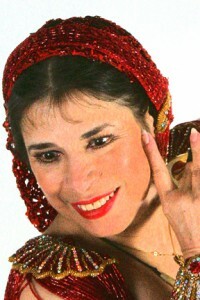 Alay‚nya (Alianna J. Maren, Ph.D.) is the author of “Unveiling: The Inner Journey” (www.theunveilingjourney.com, from Amazon, alaynya@alaynya.com), depicting Oriental dance as an authentic women’s mind/body/psyche/energy integration pathway.